Learn how to seo audit a website with SERPWoo. Downloadable checklist included too! An Updated Online Reputation Management Guide. Downloadable cheatsheet included too! An Updated Local Search Engine Optimization Guide. Downloadable cheatsheet included too! We got some exciting news, we're almost ready to release the next wave of Quantum features in the coming weeks which we've been working based on with your feedback. However before that we want to acknowledge a recent screw-up that impacted about 8% of our users who have mobile or local campaigns. Some weeks back we were testing a new caching feature on the mobile database and it caused a portion of the data to not save correctly, so there are certain dates that you might see a chunk of data missing. And you know when it rains it pours, Google made some recent updates in the mist of the data recovery that caused some additional couple of days to get screwed up as well. It was only a short burst of time but I'm happy to report we've been incident free for about 3 weeks now. To make it up to users that were impacted we are giving out a "sorry" bonus code that anyone can apply that has a paid plan. (Expires within 7 days = Oct 26th 2018 at 11:59 PM EDT). On to some good news: we've started populating the Quantum interface with rich snippets and other features within the SERPs to give you a more holistic view of the SERPs. We've got some new features coming out next week so stay tuned for that as well! Don't forget to claim your bonus code, login now (V3) or Quantum Login! @CCarter will it also show featured snippets, like when G puts a bulleted list in the top position? Currently I have to check Ahrefs for those types of snippets and a lot times it's not accurate. Not sure of the reason but many keywords it says have the featured snippet actually don't. End up wasting a chunk of time trying to verify what is correct and what isn't. Would love to see this data in SerpWoo. will it also show featured snippets, like when G puts a bulleted list in the top position? Do you mean the "People Also Ask"? feature? We plan on collecting and showcasing all the different rich SERP features that come up and their exact position. It's an on-going live process, since Google loves updating and changing the code constantly to add new things and re-arrange different placements, but we are collecting more and more every day. Unlike Ahrefs who simply says "yes there is this type of rich snippet" - we'll show the exact positions the rich SERP features are at and as much of the data that makes sense to showcase. We're still playing around with the look and feel of everything, so these screenshots and what's live within Quantum will definitely change in style as we progress. 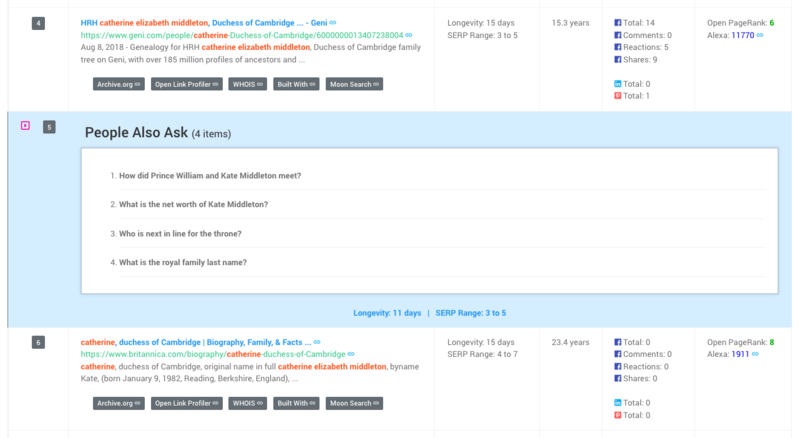 You can login to Quantum to see what we are currently displaying for your keywords and if you see something missing shoot us a message and we'll make sure to double check it and have it make the next series of rounds. We've been in the mines hard at work finalizing the Quantum interface when we realized something - a lot of free tools are being taken off the market by gurus or simply being purposely nerfed for paywall reasons. So we brainstormed and decided to fill the void that's being created within the free tools market with our new Lab section. Other similar tools do not allow accurate locality suggestions meaning you sort of have to guess what the Google UULE (location variable) will be before base64-ing it (don't worry nerdy stuff). So a user could inputted incorrect data like "999999999" and get inaccurate results. We fixed that approach by using the SERPWoo Project Wizard's locality engine and our sophisticated smart detection algorithms for misspellings. Now anyone can look up results as if they are standing at the particular location - whether it's near your client's office, or on the other side of the world, you will see Google search results, all top 100 results, and more without being limited like the Google Preview Ad Tool. Obviously if you are looking to track the results (rank tracking) on a daily basis you can login to SERPWoo and create a project with the Project Wizard and go through the simple process of creating a local search project. We are proud to introduce 2 new features within Quantum: "Teams" and "Sharing"
Now you can create teams and share projects within SERPWoo with different accounts (even free accounts). Teams allow you to group projects together and filter your interface to help you focus in on a specific client or specific goals (like ORM or Local SEO projects only). Sharing allows you to share projects or teams with other accounts (traditionally called sub-accounts). Now you can have employees, contract workers, and clients accessing projects - with "edit" or "view only" capabilities. Based on user feedback (thank you all!) - we recently updated our Keyword Finder tool within the Quantum Interface (beta) to include 18 new countries. That brings the total to 46 countries we now have keyword data for! P.S. Quantum is almost ready to launch - so get your feedback in as soon as possible if you think we can improve upon something. #3. New Teams and Sharing Feature - Now you can create teams and share projects with users. Teams allow you to group projects together and filter your interface to help you focus in on a specific client or specific goals (like ORM or Local SEO projects only). If you know anything about Jason and I is that we are constantly working on something for SERPWoo. A lot of it doesn't make it into the interface, but the ones that do change the game. Well, it's time for a couple of new game-changers. In the coming weeks, we'll be releasing a slew of new tools (some FREE) and features within the Quantum Interface, and Quantum itself will come out of beta. It's been a long road, but now the faster and more intuitive interface is ready. Quantum's structure allows us to surface more of the deeper data several of you suspect us of having. In the past some of that data has been controversial - like the blog post that caused panic within the SEO community that showed Domain Age is a major ranking factor within the SERPs (we're still getting people coming up to us at conferences and complaining about that blog post). Our goal in the coming weeks is to display the new data and show you how you can take advantage of each situation. Next week we'll be launching the next new free tool from within the SERPWoo Lab, so be on the lookout for that. I spent the past several weeks compiling and analysing Higher Education SERPs to find out what it takes to rank the first page of Google of this highly competitive industry. Not only did I break it all down to share with you in my newest blog post, but I give away a "copy and paste + find and replace" keyword list that will make any Higher Education project you do in the future painless. Find out exactly why lead forms and nofollows help your rank in the Higher Ed space, as well as several other surprises ( links and content ) that I packaged up over at our blog today. P.S. Once done reading, can you share on social media and help us out? Because the more you share, the more I can do future guides like this in other industries like Local, Finance, and more. Remember that analysis of the Higher Education industry I did a few weeks ago where I spilled the beans on what it takes to hit the 1st page of Google? I did the same for Local SEO and pushed it to the blog. Yep, data from local geolocations with local intent keywords like attorneys, plumbers, carpet cleaners, realtors, and more. Not only did I break it all down to share with you in my newest blog post, but I give away a "copy and paste + find and replace" keyword list that will make any local marketing project you do in the future painless. P.S. Once done reading, can you share on social media and help us out? Because the more you share, the more I can do future guides like this in other industries like Ecommerce, Finance, and more. It's nice to see that you removed directory sites and Yelp. When I'm looking at things like this I also remove sites which have abnormal backlink profiles. I'm trying to isolate and find example of pages which are ranking based on their on-page, rather than as a result of good on-page plus 10x the link equity of competitors. If you ever update this local study @eliquid it would be cool to see correlation of GMB factors and also 'trust' signals like hours of operation on page and location on page. Likewise, interested to see how lead gen sites are faring these days vs local businesses in organic SERPS. A couple hours early, but why not?